I just finished watching the making of Rodgers and Hammerstein’s Cinderella aired over at ABS CBN and I found it fascinating (irritating and frustrating too! …. read on and you’ll understand why) to have a glimpse of what they do to deliver a wonderful show. It was nice to see the cast without the frills of the costume and makeup. But it would have been nicer to HEAR how they really sound like. Why? Because they dubbed the interview with the foreign cast in Filipino but pretty much left the interview with Lea in English. I mean, the play is in English, therefore, the cast speak the language. So what’s the logic behind the dubbing? I don’t get it. If these people were French, Korean, Taiwanese… then it’s perfectly understandable to dub it in the vernacular. But for crying out loud! They speak English! People are not so dumb, ABS CBN. We do understand English. Thank you. If the idea is to let everyone (and I mean everyone awake who was tuned in) understand the whole tv special, they should have asked Lea to speak Tagalog, right? Just my opinion, though. It made the behind-the-scenes interview comical. Wasted energy on dubbing. Really. Despite the heavy rains last Thursday, we braved the terrible traffic and headed to the Main Theatre of the Cultural Center of the Philippines to watch Rodgers and Hammerstein’s Cinderella. 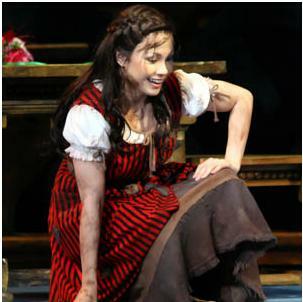 Playing the role of Cinderella is no other than Tony awardee, Lea Salonga. Peter Saide, on the other hand, plays the role of Prince Charming. It was written in an article in the Philippine Star that it is a $2M production and this is very much visible in the lavish sets and elaborate costumes. Mind you, it was jaw-dropping. By the way, do you know the full name of the Prince? It’s Christopher Rupert Vwindemier Vlandamier Carl Alexander Francois Reginald Lancelot Herman. Whew! It took me ages to search for his full name. I should’ve just look for the song, The Prince is Giving a Ball, and his name is there in its complete glory. But I have to give it to the Wicked Stepsisters for keeping the crowd entertained. Yes, Lea and the Prince were the stars but the wicked stepsisters were the comic relief. They were simply hilarious with Portia’s pumpkin-shaped gown and Joy’s creaking knees. Believe me, you will leave the theatre wondering how Lea’s transformation from her country bumpkin outfit to her glorious gown happened (we wanted to have a rewind but we all know that’s impossible). That’s how she looks like and then she transforms to this girl in magnificent gown (“sparkly” was how the girl seated behind us described her) complete with coiffure. All in all, it was a great show. I then remembered the promise of the creative team and cast of Cinderella, “Prepare to be mesmerized.” Well, it very much lived to its promise.